One of the key spacecraft in Europe's new multi-billion-euro Earth observation programme has launched from French Guiana. Sentinel-2B carries a large camera to image all land surfaces and coastal waters in visible and infrared light. It joins an identical spacecraft, Sentinel-2A, already in orbit. The duo will be flown on the same path but 180 degrees apart so that they can provide a complete map of Earth - clouds permitting - every five days. The Sentinels constitute the space segment of the European Union's Copernicus environmental monitoring programme. A suite of sensors is being lofted over the next few years to gather critical information on the state of the planet and to acquire the data needed to inform and enforce EU policies. Applications range from urban planning and air-quality monitoring to tracking deforestation and glacier retreat. Sentinels 2A and 2B are, in many senses, the centrepiece of this effort because their free and open picture resource will almost certainly find the widest use. "To say they are the 'heartbeat' is a good way to describe them because they take the images that are most easily understandable," Josef Aschbacher, the director of Earth observation at the European Space Agency (Esa), told BBC News. 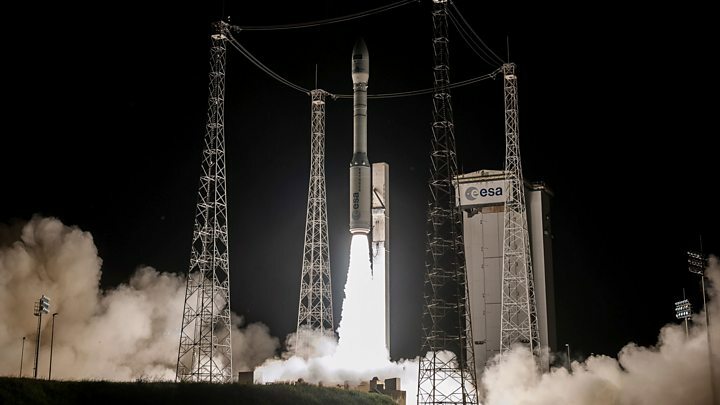 The lift-off aboard a Vega rocket occurred on cue at 22:49 local time, Monday (01:49 GMT, 02:49 CET, Tuesday). Ejection of the satellite happened about an hour later, close to 775km above the Earth. Controllers in Darmstadt, Germany, were waiting to pick up a signal and begin early operations. "We will slowly acquire the reference orbit (786km altitude) over the next two weeks," explained Bianca Hoersch, Esa's mission manager for the Sentinel-2 spacecraft. "Then we have the commissioning phase; that takes us to early June. At that point we should be producing lots of data, and after a short ramp-up, around the October timeframe, we should be in full constellation readiness." The colour cameras on the Sentinel-2 pair are designed to see features as small as 10m across. Sensitive to 13 bands of light, the instruments will observe a range of properties in the things they see, allowing for example the distinction to be made between different types of crops and for an assessment to be made about their health. Together, they will be producing something like four terabytes of data daily. It is a prodigious volume that will lean on the assistance of a laser relay link. For a 10-minute spell on each orbit, the spacecraft will each fire their images not down to Earth but higher into the sky, to a geostationary satellite that will then bounce them to the ground. Thousands of users have registered to have access to the pictures. Downloading them from the various distributed servers has been made easier by chopping the "scenes" up into more manageable chunks. "With Sentinel-1A, we had at the beginning huge products that were 8GB to 9GB per file, which were really hard to access and download," said Dr Hoersch. "In September, we switched to single tiles, a product of 100km by 100km, and I think that has led to an explosion in data access. We've had 2.7 million products downloaded in the last two months." Sentinels are designed to fly in pairs to shorten the revisit time to any one point on Earth. Sentinel 1 is a radar platform and has had its duo fully operational in orbit since last year. Sentinel 2 is the next to complete its pairing; Sentinel 3, which carries predominantly ocean sensors, should have an orbiting pair aloft come next year. Sentinels 4 and 5, which study the atmosphere, and Sentinel 6, to measure ocean height, have no presence in orbit yet. But even though the programme is still to complete its initial roll-out, the EU and Esa have already begun to discuss how to extend it. In this future-scoping, Sentinel 7 is envisaged to be a constellation of satellites that monitors carbon dioxide; Sentinel 8 could be a thermal infrared sensor, useful for understanding phenomena such as drought; and Sentinel 9 might be a polar mission, either to study the extent and thickness of ice surfaces or to provide better weather imaging and communications at high latitudes. "But I should stress that all these candidate missions are a work in progress and will have to be consolidated through an extensive consultation process, both on the user side and on the technical side," said Dr Aschbacher. "And we also have to put together a whole scheme, not just on content but but also in terms of cost and funding."